Last weekend, we had a booth at the Mat-Su Outdoorsman Show, where we distributed visitor guides and talked with folks about all there is to see and do in the Mat-Su Valley. Often, people would pick up the visitor guide and tell me, "my relatives are coming up this summer and I don&apos;t know where to send them" or "my relatives came up last year, and we did things I didn&apos;t even know about." Well, don&apos;t rely on your relatives - get out there and explore Alaska this summer! You&apos;d be surprised how many Alaskans haven&apos;t explored their own communities and experienced things visitors can&apos;t wait to do. At the Mat-Su Outdoorsman Show, I think I "surprised" a few people by asking them the last time they had walked on Matanuska Glacier, the state&apos;s largest road-accessible glacier and just an hour trip north of Palmer. Or if they had ever circled Mount McKinley on a flightseeing trip from Talkeetna. Or even just visited Talkeetna, just an hour north of Wasilla. Not many, it turned out, which is baffling. This summer, take a vacation without ever leaving your home. You&apos;ll be amazed at some of the things you can do with just one tank of gas and a sense of adventure. Make it a point to zipline the boreal forest in Talkeetna this summer. Or hike Gold Mint Trail in Hatcher Pass, with spectacular views of the Valley down below. Or head up the Glenn Highway National Scenic Byway for an overnight trip that includes rafting, glacier trekking and ziplining. 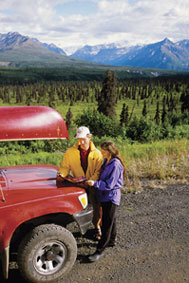 For an extended adventure, head up the Parks Highway to Denali State Park and explore Kesugi Ridge and Byers Lake. The Valley is a great playground, and not just for visitors. Poke around this Web site, or grab a visitor guide, and start mapping out your summer adventures now. You won&apos;t be disappointed, and you&apos;ll have a jam-packed calendar. And not to mention, you&apos;ll be an expert tour guide when your visiting friends and relatives arrive!